Today is the 8th anniversary of BooksPlease. Eight years ago I’d just left work and had more time to read and write about books, so I began this blog partly to help me remember what I’ve read and also to extend the pleasure of reading and to record what I thought about the books. And so ‘BooksPlease‘ was born. Right from the start it’s been more than just a book blog and I’ve also written about art, pets, places I’ve visited, personal anecdotes or thoughts, cookery, walking, travels and holidays, and about crafts, such as knitting and cross-stitch – and well, anything else that interests or pleases me. On the book front a recurring theme over the years has been ‘what to read next‘. Choosing what to read next is almost as pleasurable as actually reading the books. 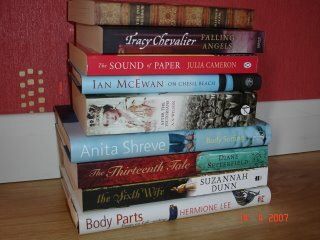 This is the first photo I posted showing a pile of some of the books I had waiting to be read in April 2007. It seems so long ago now! I don’t always manage to read all the books I list as possibles but in this case, although it took me a while, over the years I have read these books (with one exception, The Sound of Paper by Julia Cameron, although I did start it – my bookmark is still at page 61). I really enjoy blogging – the contact with other book bloggers, exchanging views on books and finding yet more books to read makes it even better. I love reading your comments and hope you’ll continue visiting and commenting on my blog – I really do appreciate it. 8 years and all those books! I love the thought of choosing what to read next and I can never make up my mind! Well done. I enjoy reading your blog. 8 year is amazing in today’s quick flash in the pan blog world! I think it’s because you are trying to please no one else but yourself – so you are true to yourself and to the books you read, rather than trying to build audiences, followers, jump on trends etc. etc. Here’s to many more happy years of reading! It’s been a pleasure ‘knowing’ you. Congratulations! I always enjoy reading about your finds – here’s cheers to many more years of blogging fun. Congratulations Margaret. I’ll be 7 in June and never expected to get so much pleasure out of blogging and sharing with others live yourself. Happy Anniversary! BooksPlease is one of my favourite destinations. Apart from the books I’ve also really enjoyed your travel posts, which have told me of places to visit which I never would have found otherwise, such as the standing stones. Congratulations, Margaret! Even on my busiest days, I take the time to read your posts since you are one of my favourite bloggers. Congratulations and well done, Margaret! That’s fantastic! Wishing you many more years of blogging! I always enjoy reading about your selections. We have a very similar taste in books & now I find out that you enjoy the process of picking your next read as much as I do. Hugs & Cheers to another 8 years of happy reading! Congratulations, Margaret! I love visiting your blog. 8 years is a great achievement! So enjoy your blog and all your comments! I’m a big fan of Tracy Chevalier, but still haven’t read Falling Angels. Need to remedy that myself. Happy anniversary, great selection! Loved On Chesil Beach, Poe Shadow and Falling Angels, but was a bit meh about The Thirteenth Tale. Belated congratulations, Margaret! I love the origins of your blog’s name. And that picture – a lot of great books there, must’ve been a good starting place.